Dark Horse Comics has three new Star Wars releases today. look into Ania Solo’s prison-camp past reveals a secret connection to the brutal bounty hunter who is desperate to bring her to justice—dead, not alive! * The answer to “Who is Ania Solo?” is at hand! Free from the false charges against him, former Padawan Zayne Carrick discovers that one of his allies, Jarael, has been running from her past. Soon Zayne is caught in a web of sport dueling, slavery, an evil twin, an ancient society, and finally, the frontline of the Mandalorian Wars. 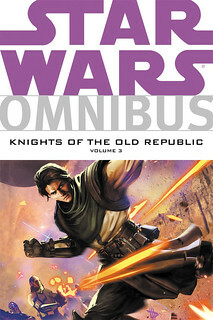 Collects Knights of the Old Republic #38–#50 and Knights of the Old Republic—War #1–#5 (part of volume 7 and volumes 8–10). * Expands the story of the smash-hit video games! * From the New York Times best-selling novelist John Jackson Miller! Click here for a three page preview. Together with their old friend Dass Jennir and a new Jedi acquaintance, the crew of the Uhumele is plotting to take down the Galactic Emperor’s second in command, Darth Vader! For this foolproof plan, they’ll be offering something the Dark Lord won’t be able to resist: Jedi. 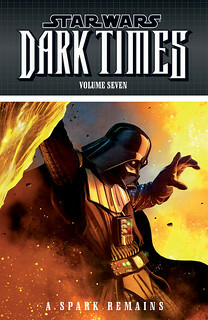 Collects Star Wars: Dark Times—A Spark Remains #1–#5. * Vader on the hunt . . . for Jedi! * Darth Vader grooms an assassin for the Empire! A Spark Remains ends with issue #5 and the big showdown is ready. While we keep the review spoiler free, fans will want to check out the issue to see who lives and who dies. But the real question is the payoff. 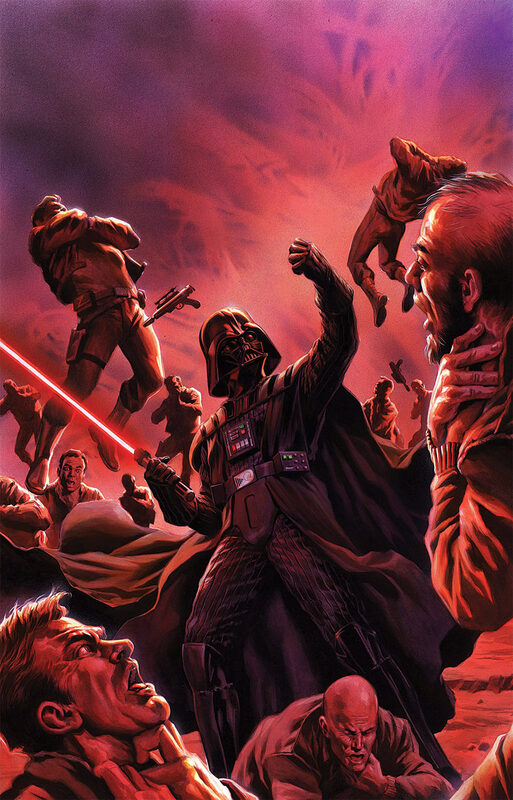 For a five issue arc all leading up to a climatic confrontation with Vader, can they pull it off when we all know Vader will be the one who survives? Click here to read our full review. Dark Horse Comics has a bunch of new Star Wars issues out today with A Spark Remains coming to a close and The Cry of Shadows kicking off a brand new Darth Vader mini series. Plus there’s more Dawn of the Jedi and Legacy. You can check out Star Wars artist Dave Dorman‘s American Academy of Arts lecture online. In the video, he covers the full extent of his art career. At over an hour in length, you’ll need to set some time aside to watch this one. Here are the Star Wars solicitations from Dark Horse Comics for February 2014. Dark Horse Comics has one new Star Wars release today, Dark Times: A Spark Remains #4 (of 5). Click here to check out our full review. Darth Vader is on the trail of one Jedi—little does he know that even more Jedi are aware of his search and his impending arrival on their planet. The Jedi and their friends are waiting with a trap to end Vader for good. But this is a dark lord of the Sith they will be battling—and nothing is certain! * A few of the last surviving Jedi plant a trap for Darth Vader! Dark Times: A Spark Remains #3 cranks up the action with a massive lightsaber brawl. With all the destruction that’s unleashed, this is an issue Dark Times fans will definitely not want to miss. Click here for our full review. Darth Vader readies an assassin for Jedi hunting while scouring the galaxy for hidden prey. Elsewhere, the Uhumele’s crew plots to strike down the Dark Lord himself, but the revelation of their own life-or-death secrets threatens to unravel everything! * Darth Vader zeroes in on Jedi survivors! After the destruction of the Death Star, the Rebels are hounded by the Empire. Suspecting a spy in their ranks, Princess Leia forms a secret X-wing squadron—which includes Luke Skywalker—to expose the spy and find a safe home. Meanwhile, Han Solo and Chewbacca are sent on a covert mission! Collects Star Wars #1–#6 and Free Comic Book Day 2013. On Coruscant, Darth Vader continues his obsession with ending all Jedi. Across the galaxy, Jedi Master K’Kruhk is on the run with a group of young Padawans. Forced to land on an Imperial-run planet, they hide with other refugees. Immediately, K’Kruhk senses something wrong. They must sneak away, and hope that they can escape the Empire . . . Collects Star Wars: Dark Times—Fire Carrier #1–#5. A century after the death of Darth Vader, the Sith have returned and the galaxy is on the brink of war. The one hope for stopping the Sith lies with ex-Jedi and would-be pirate Cade Skywalker, the last of the Skywalker lineage. But Cade has plans of his own . 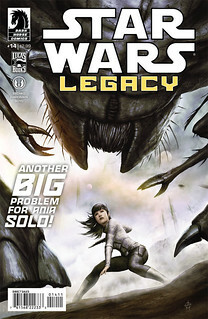 . .
A couple weeks ago StarWars.com provided an early look at Dark Horse Comics Star Wars solicitations for December 2013. Now the official solicitations are out, and details have been revealed for Tim Siedell’s new Star Wars comic Darth Vader and the Cry of Shadows. Joining Tim on the new series is Dark Times: Fire Carrier artist Gabriel Guzman and prolific Star Wars colorist Michael Atiyeh. It also has a gorgeous cover by Star Wars newcomer Felipe Massafera. Below you’ll find all the details and more, plus more titles that weren’t mentioned in StarWars.com’s sneak peak. StarWars.com has a special look at the December 2013 Star Wars solicitations for Dark Horce Comics.